The BOGO is back! We’re running a Buy One Get One sale on Choice Credits for 72-hours starting tomorrow at 7am ET. Just call 800-234-8727, select your Choice Credit bundle size, and get double the credits. It was a pleasure to serve you in 2016 and we’re looking forward to a great New Year! This concludes the 12 Days of Features, to review the full list click here. Cheers! The Choice Credit BOGO Sale expires Monday, January 9, 2017 at 7am ET. 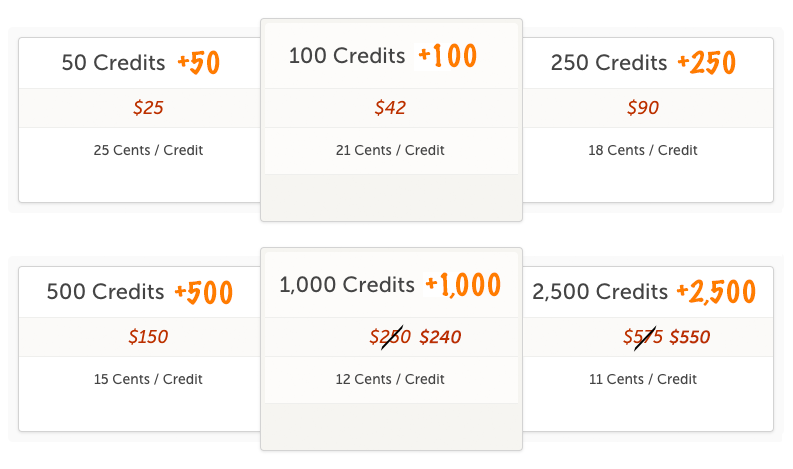 Offer applies only on bundles of 50, 100, 250, 500, 1,000, and 2,500 Choice Credits. Valid one sale per person and/or office. Choice Credit BOGO applicable to ACI Report users only. In 2016, we created an update that includes a collection of calculators, file management tools, smarter data extraction technology and more functional UAD helper modals (screens). This quarter we will be rolling these updates into a new desktop release called ACI ONE. Here are some of the ACI ONE features that are available today. “Smart Merge” is a data extraction tool that leaves existing data on the form and fills in the blanks with data from another report. This comes in handy when you want to import data from a prior inspection or comparable. 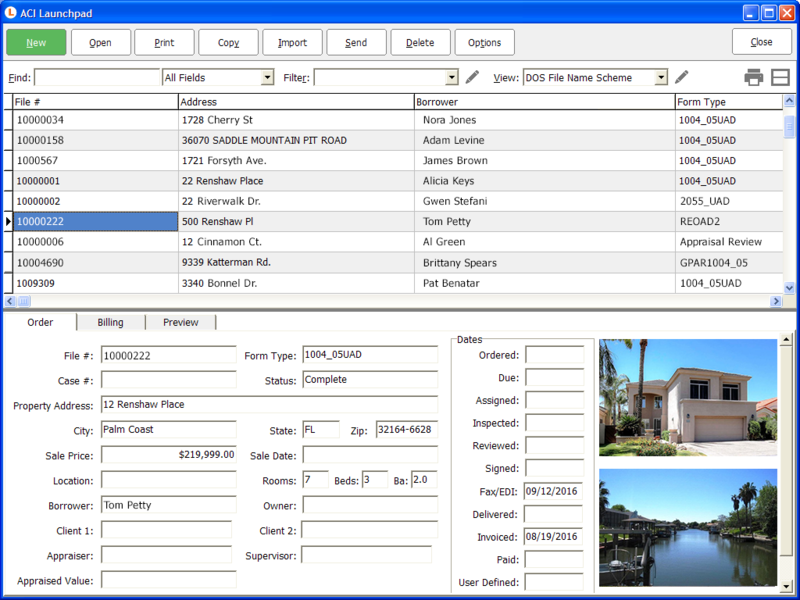 Just open an appraisal file as always, then from any field just right click and select Extract/Merge. Next, choose the source file/report and check the new option to “Merge, keep existing data if import is blank” and — voila! — all the data falls into place! UAD helper screens were also enhanced in the ACI ONE update. We improved the aesthetics, increased the text size for greater legibility, and expanded the comment areas so you can see more without scrolling. The new modals also have support for big font settings on your PC, and we added your field picklist into the modal for quick access. All ACI ONE updates are included at no additional cost for current subscribers. Just run WebUpdate with the Special Update ID ACIONE to incorporate these features into your existing version of ACI Report. As always, we’re here to help you, just email onecall@aciweb.com or call 800-234-8727 if you have any questions. There one more day of feature fun on the way. For the full list of the 12 Days of Features to date, click here! 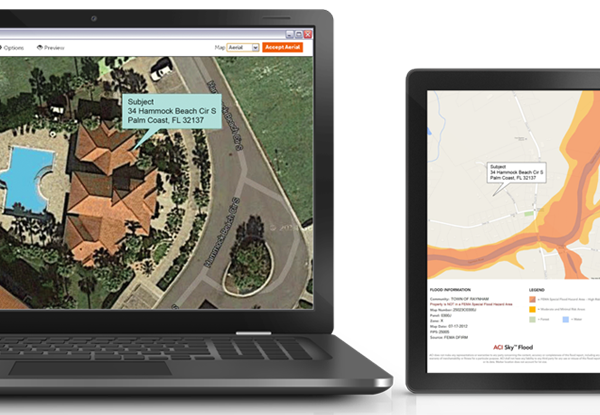 Powered by Google Maps™ – ACI Sky Maps, Sky Flood, and Aerial imagery are the best quality maps in the biz. Modern and compelling, adding these maps boost the quality of your work product, and help make your reports stand out from the pack. We provide three different map views – road, satellite and hybrid. Paired with our two new label options – outline and fill, you can customize your maps to match your personal style. There’s also an option to auto-add aerial maps to your report when you gather your location map. Click here to read all about this time-saving tip. Are you an individual appraiser buying credits for mapping? Call and ask us about our individual membership plan that includes unlimited flood and location maps. There’s more feature fun on the way. For the full list of the 12 Days of Features to date, click here! Are you overwhelmed with seemingly endless compliance requirements, time-consuming revision requests, or having to resubmit a report just to insert a semicolon? If so, ACI can help! Our PAR Logic rules library includes over 5,000 rules designed to help you stay compliant with the ever-changing appraisal requirements. When you select ReviewMaster in ACI, you’ll notice dozens of different rule sets. Many of these are custom rules for the top Lenders and AMCs, while others are specialized sets that are “on the menu” for you to choose from depending on your assignment. Below is a quick summary of the more popular rule sets including guidance on usage and applicability. Best of all, these rule sets are included as part of your ACI membership, at no additional charge. We recommend making our standard PAR Logic review as your go-to compliance check. 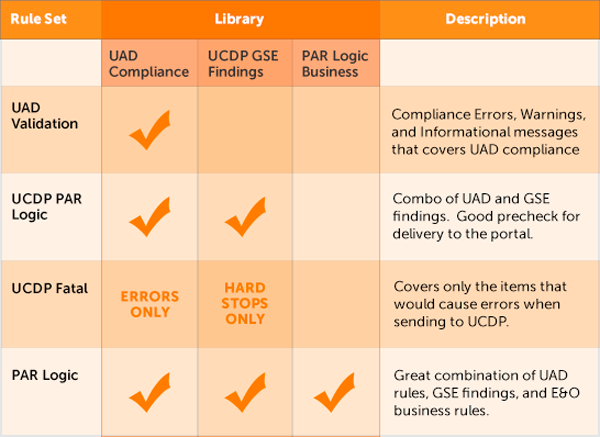 In addition to its comprehensive E&O coverage, PAR Logic provides UAD compliance checks and serves as a helpful pre-check to the GSE findings that your lenders would see at the UCDP. ACI provides appraisers with BEST IN CLASS service including early morning and late night hours, weekend support, educational blogs by Richard Heyn, SRA, and FREE, live online training! We encourage you to take advantage of these services that are included with all standard membership packages. We’ve released a number of updates and a few new products that you can quickly learn about in our 20 minute, cut-to-the-chase, classes. Our webinar schedule includes classes on Sky web-based appraising, ACI Analytics, ACI Sketch, and the new features in ACI One. Below is a list of upcoming classes, or you can view the full calendar here. Have you heard about ACI Sky? Complete reports in the field, with our new completely web-based appraisal platform. It has tools for data and photo collection along with Sketching, Location Maps, and Flood Determinations – Sky has everything you need to get the job done. ACI One includes smarter, faster, and better features that will streamline your workflow and help you produce more substantiated appraisal reports. Learn all about the new Add/Remove Forms utility, Weighted Value Calculator, Smart File Merge, and Express MISMO® XML Delivery. An intuitive interface makes ACI Sketch™ the best choice in sketching software available today. Use photometrics to trace blueprints and aerial imagery for a quick exterior sketch. Then spruce up your floorplan with Symbols and Labels. This class will go into keyboard shortcuts, creating negative areas and other efficiency tips. In this class, we’ll explore ACI Analytics which includes a market conditions breakdown, market analysis, comp selection, and statistical analysis – including regression. Also, ACI Analytics now includes a listing data feed. If you prefer to export data from MLS – we’ll walk through mapping your file in this class as well. Did you know that ACI includes 1GB of free online file storage with every membership plan? That’s right, no expensive per-file costs or complicated setup. Simply select some files and with a touch of a button, they are securely stored in the cloud. It’s perfect for backing up report files, cold storage for workfile data, or transferring data to a new computer. Quickly select your last 10, 50, or 100 files with the “Select Files” drop-down. It automatically compares the versions of the files, so you can decide which one you want to keep, allowing you to store a separate copy or replace existing files. To get these new features and functions, run WebUpdate. 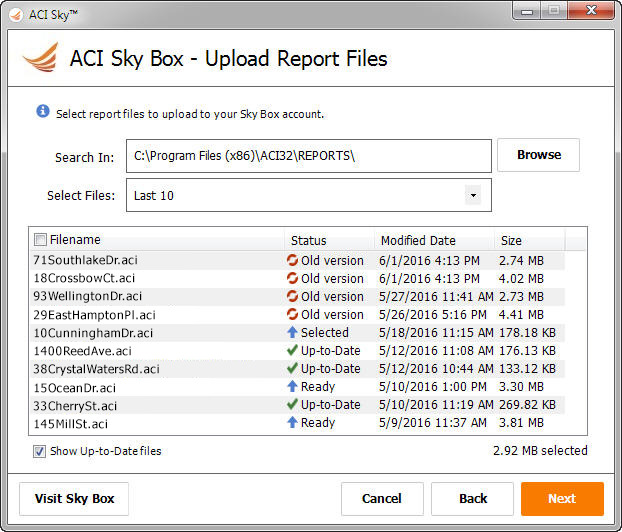 To open Sky Box close all reports and go to eServices > ACI Sky Services > Sky Box. Enter your Sky Box login credentials and follow the on-screen prompts. If you don’t have a Sky Box account, email One Call and we’ll get you set up. ACI One now includes the new Launchpad feature to quickly locate reports. This new tool will give you quick-and-easy access to Find, Filter and Custom View Schemes that are designed to help you locate an appraisal report or even multiple reports. For example, you can search by any field and narrow your results to display only last week’s files. The split screen design provides a peek-a-boo into the order information, billing details, and even a preview of the full report contents without opening the file. Print, Import, or Send reports right from Launchpad. Simply being able to search by ZIP Code makes this feature so helpful, but we are also adding the ability to launch a file to ACI Sky in Q1 2017. One of the top reasons appraisers get in trouble with State regulators is using the Fannie Mae/Freddie Mac forms for non-lending assignments. ACI has an entire series of proprietary forms that are perfect for non-lending assignments. 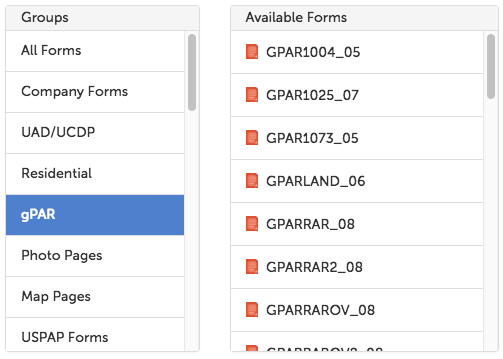 If you are not familiar with the gPAR family of forms from ACI, you are missing a valued resource. To add a gPAR form to your report, select Add/Remove forms and use the predefined forms group “gPAR” to view all of the available gPAR forms. Drag and drop or double-click to add a form to your report pak. We have a variety of gPAR forms for non-lending assignments, including condo, full, restricted, and land appraisals. 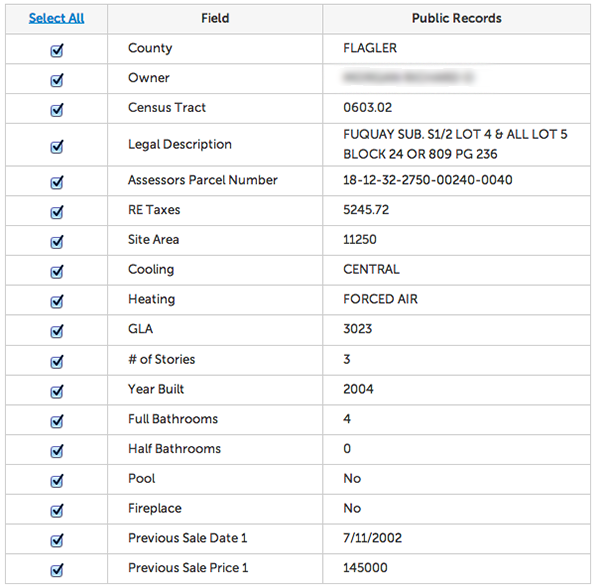 ACI Sky Data provides easy access to national public record data for your subject property and comparable sales. Best of all, Sky Data is included, at no additional cost, with all Data and Delivery membership plans. Most counties include parcel number, short legal description, Census tract, tax information, GLA, site size and previous sale information. Some counties even include detail for rooms, heating and cooling, pools, fireplaces, etc. Plus as an added bonus, Sky Data now includes FEMA flood zone information for your subject property. Go ahead and give Sky Data a try — just key in an address within a report and go to eServices > Sky Services > Sky Data to see what data is available in your area. Stretch out and get comfortable! Did you know that ACI Report™ has the ability to span multiple monitors? With this feature, you can efficiently multitask and see forms, rules, maps, and photos all at the same time. To “undock” any of the components, Right Click on a component icon and select New View > Multi-monitor. Then drag and drop the windows to arrange them to your preferred location. It’s that easy! View the PAR® Logic rules on one display and your report on the other. Then you can glance over at the rule while making edits to your report. Scan your location and aerial maps while entering the neighborhood boundaries and describing the neighborhood. Jog your memory with a visual reference. Keep your Sketch and Interior photos in view as you enter your improvement data on the form or addendum. Open multiple views of the same form to work on different pages simultaneously. Or open different forms like REO addendum and 1004 side by side!